In which Montreal’s venerable Redpath Museum is considered through a series of metaphors, similes, and random observations. The Redpath Museum is like a Ford Ranger truck. If you look at it without any scale against which it can be measured, you might be hard-pressed to tell that it is any different from the full-sized model, as it is similar in almost every feature. The building looks tremendously tall and impressive, standing in neoclassical splendour as you approach across rising lawns. But after spending time in it, you begin to realize that it is smaller than it had seemed. There is definitely less mileage here than in a full-sized museum, and perhaps it lacks a bit in pulling power. Still, in most exhibit situations it has everything it needs to get the job done. The Redpath Museum is a Wrangel Island mammoth. I don’t mean that it has a trunk and tusks, or that it is anything like extinct. But it evolved in what was then a remote “island” environment, far removed from the main herd of grand European-style natural history museums. Sure, Montreal had already existed for hundreds of years by 1882, but it was still a small city near the edge of a great empire. In this colonized place, with limited resources, the Redpath had to be smaller and more efficient to exist and survive. The Redpath Museum is a chocolate box. Like any good chocolate box, there are more layers of good stuff down inside, and some of the best treats are mysteriously packed in special wrapping, or hidden away in the corners. I was tempted to say that the Redpath is like a Russian matryoshka doll, but in a matryoshka each femuncula is opened to reveal a smaller but similar one inside. The Redpath is not like that. Heck, it even has red ribbons on the outside, so it is definitely a chocolate box. 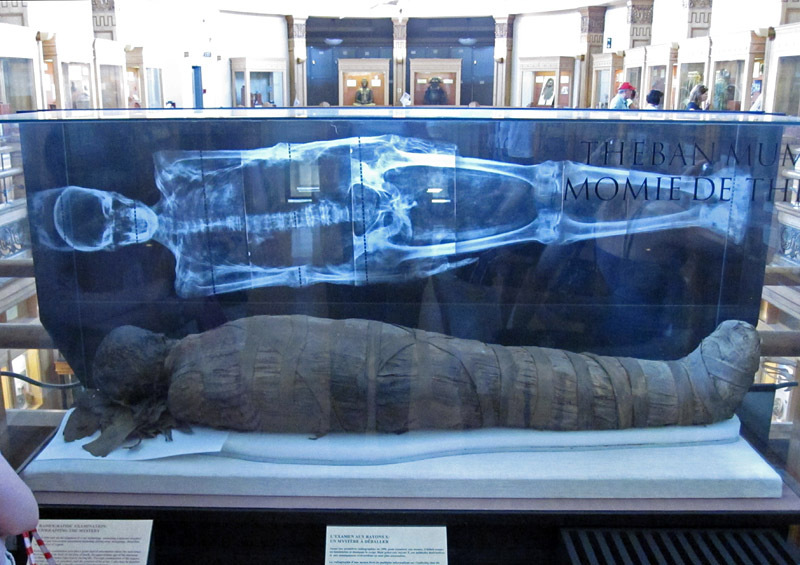 Special wrapping: Upstairs, you find fascinating exhibits of Egyptian mummies. Skeletons are affixed to the walls of the main floor corridor. 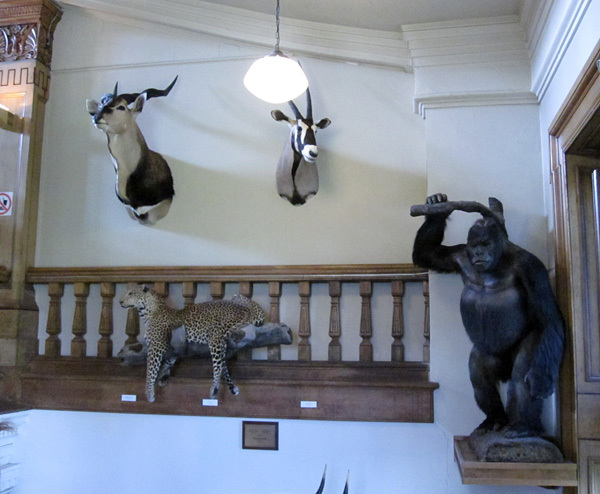 African creatures decorate the staircase. 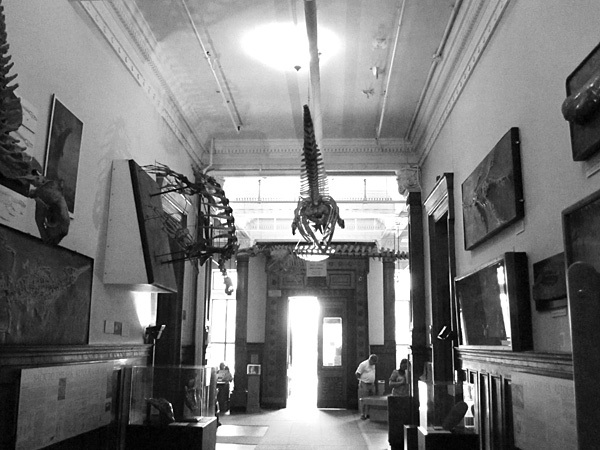 The Redpath Museum is a house built of bones and leaves. And sugar. Sir John William Dawson, the principal of McGill University for almost 40 years, was one of Canada’s greatest 19th century scientists. Dawson collected and described tremendous numbers of fossils, many of them fossil plants from the Carboniferous rocks of Nova Scotia. It was from Carboniferous rocks at Joggins that he also collected very significant early reptiles and amphibians. Dawson possessed a unique combination of scientific acumen, collections acquisition, and prominence in the community. These qualities attracted the financial support of the sugar mogul Peter Redpath, for whom this house is named. The tyrannosaurid is beautiful in this neoclassical setting. 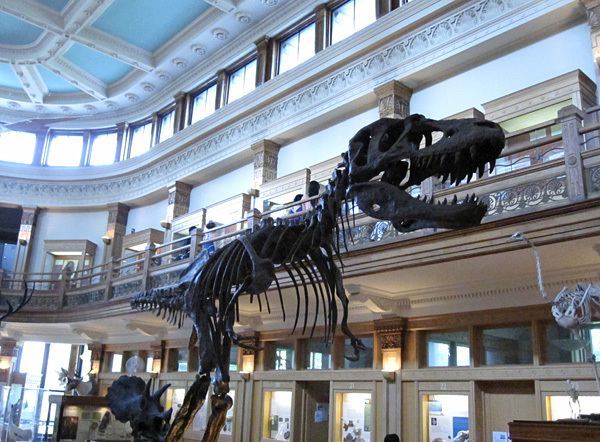 Perhaps all dinosaur halls should look like this? The Redpath Museum is an elder. 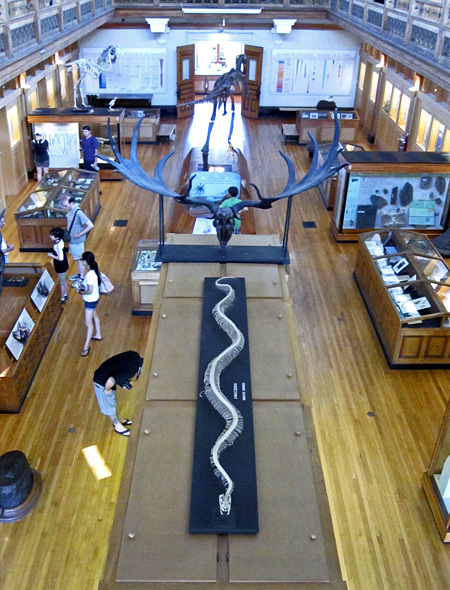 In comparison with most other Canadian natural history museums, it is decades older, generations older. The Redpath’s building predates by about 30 years our two other senior institutions, the Canadian Museum of Nature and the Royal Ontario Museum. When it was opened, Canada was only 15 years old, and the now-great cities of the west were mud-roaded gaggles of shacks out on the bald prairie. 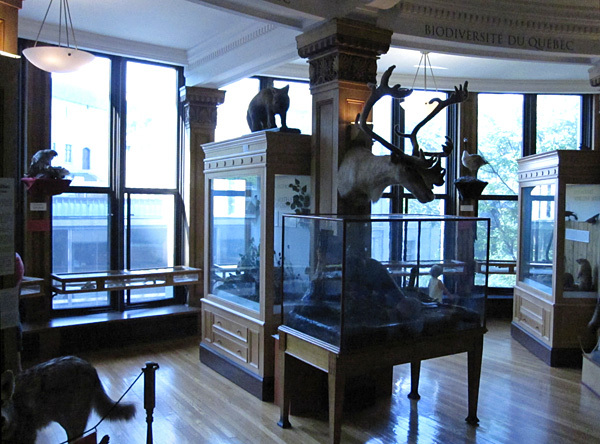 Certainly there are other natural history museums in Canada that have very old collections, but the Redpath is unique in its conjunction of collections and construction. 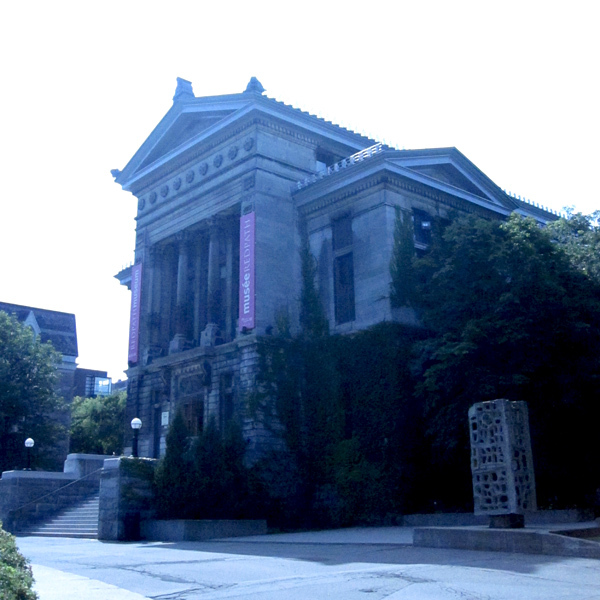 The Redpath Museum is a true temple of learning. Look at all those beautiful glass cases exhibiting row after row of taxonomically-arranged specimens and artifacts. The museum is a monument to reason, its systematic exhibits a set of holy relics reflecting the order that science was making of a chaotic natural world, its sacred texts the facts that are supported by observation and data. With those goals in mind, of course the architecture must evoke a classical temple! The Redpath Museum is an artifact. 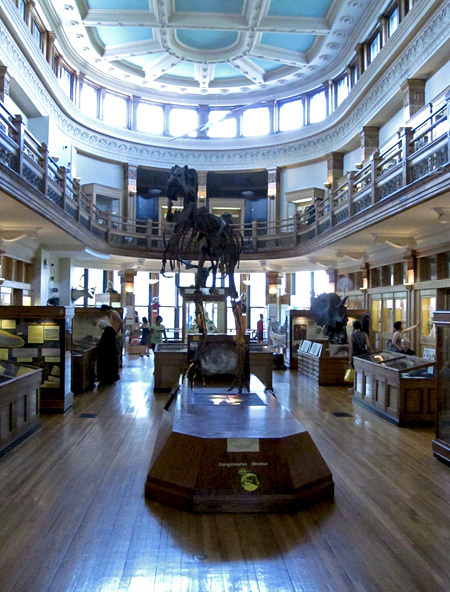 I wish I could visit the Redpath of 100 years ago, to wander among cases of plants from the Carboniferous coal measures, elephant skulls, and Professor Ward’s superb Megatherium replica. Can’t you imagine an afternoon engrossed in examining pieces gathered from far corners of the world, appreciating whatever catches your eye, adding to your store of wonderfully esoteric and useless knowledge? Even at this remove I can smell the wax of the wooden floors and see floating dust specks illuminated in the light from those windows. But wait … visiting it today is not really all that different. 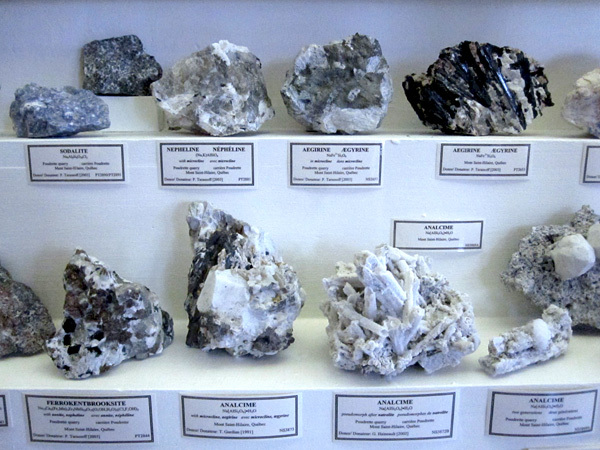 Some of those specimens are still there, and some of the newer pieces are completely in keeping. In a traditional natural history museum, the exhibits that work best, the most exciting ones, are the ones that embrace their setting. 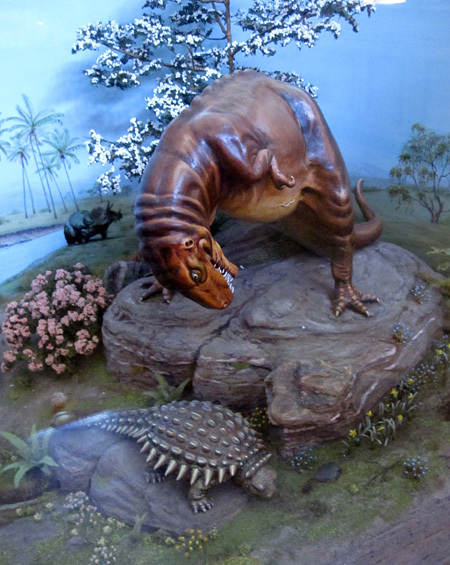 This dinosaur mini-diorama is charming, but far from the modern understanding of these creatures. 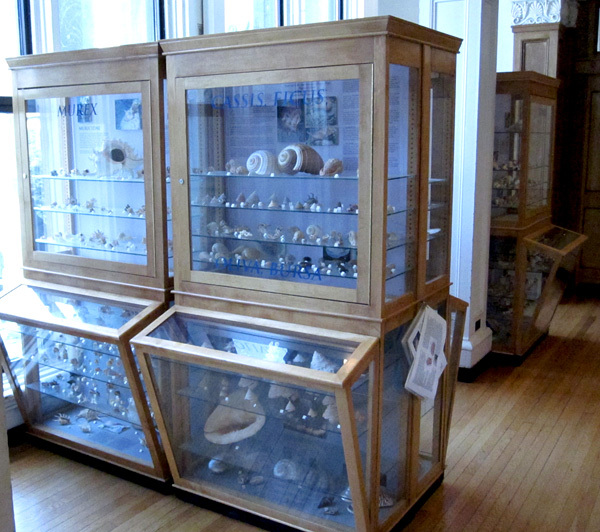 These biodiversity exhibits are located in and around beautiful casework at the end of the gallery, though the sunlight is hard on the mounts. I compiled most of this piece during a long wait in Montreal Airport, watching the sleet gust out of the low cloud onto the runway outside. It seemed inspiring, somehow, even though my visit to the Redpath had taken place on one of the hottest days of the summer (why do I always visit these old museums when they are at their least pleasant?). Yes, you should photograph it! For a museum that has been around for a long time, there are very few good photos of the Redpath to be found online. I’ll let you know if I swing it. Redpath circa 1893 looks incredible! Have you been to the Museum of Nature in Ottawa? I haven’t been there since the complete overhaul was done but I’ve been meaning to photograph the outside and visit the inside. Yes, if you dig deep enough in my blog, there is a piece I did about CMN after a visit last year. The renovations are very interesting.